RSL Poll: Is Big Papi 'Selfie-Gate' a big deal? 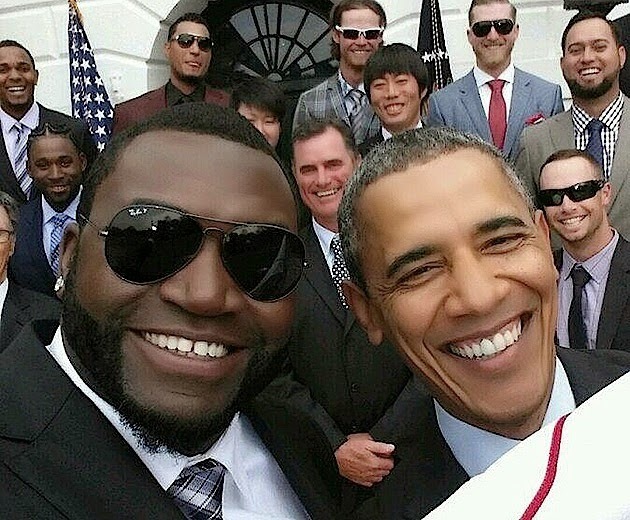 The Red Sox win the World Series, get invited to the White House, Jonny Gomes goes all Captain America and David Ortiz snaps a selfie with the president. No big deal, right? Not so fast, Red Sox Nation. "Selfie-gate" has turned into a "thing" as it's been reported David Ortiz had a deal with Samsung to make a little cash if he could get a pic with the prez. The photo was retweeted over 40,000 times. “That was one of those things that just happened. I gave him the jersey, and the photographers were going to take their pictures and I thought, really at the last second, maybe I should snap a shot with my phone while I have the chance. However, the fine folks over at Samsung (send me a phone please) confirmed Ortiz has a deal with the company and distributed the photo to its 5 million Twitter followers. The White House is reportedly miffed about the whole selfie subterfuge. According to the AP, White House press secretary Jay Carney says the White House "objects any time the president's image is used for commercial purposes." Carney didn't say whether the White House has asked Samsung to stop using the image. Is Big Papi's selfi-gate a big deal?